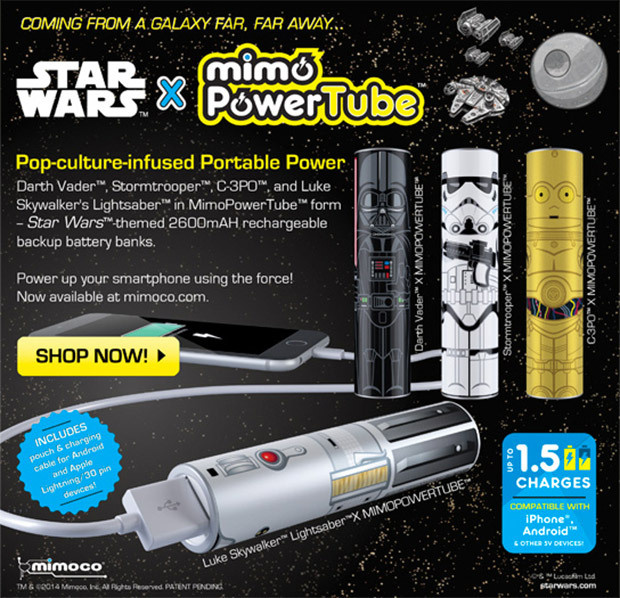 Charge your smartphones with the power of the Force when you use these Power Tubes from Mimoco. These devices come from a galaxy far, far away to make charging your gadgets fun. You can choose from Darth Vader, C-3PO, a Stormtrooper or Luke’s lightsaber. Why any product would choose to offer C-3PO before offering R2-D2 is anyone’s guess, but there you go. This is a nice compact charging solution for geeks on the go who want to show their love of Star Wars. I would choose Luke’s lightsaber. Each includes a carrying pouch and charging cable with adapter tips for MicroUSB, Apple Lightning and 30 pin devices. I’m guessing they’re powered by midichlorians.